21 % Government tax and service charge. Welcome drink and chilled towel on arrival. Daily tropical fruits and fragrant flowers in the room. Daily homemade cookies in the room. Free 2 bottles of mineral water daily in the villa/room. Daily afternoon tea served with many variety of Balinese cakes. Once Romantic Candle Light Dinner. Daily tasty choice any kind of breakfast available. Cultural visit to The Neka Art Museum, includes entrance fee. Once 60 minutes Relaxing Balinese Massage. Free scheduled of Balinese cultural activity during stay. Free scheduled of every hours shuttle service to and from Ubud town valid for Komaneka at Tanggayuda. Free shuttle to and within central Ubud area 6 times a day valid for Komaneka at Bisma. 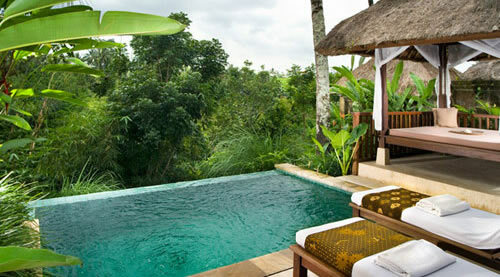 High season surcharge of US$ 55 per night will be applied for the period of 1 July - 31 August and 24 December - 6 January. Two nights room value will be applied for the No Show or cencelled within 14 days prior the arrival date for the high season. Check in time is 14:00 PM. and check out time is at 12.00 Noon.